The goods area will be adapted with a turntable and possibly shrunk a little for some extra scenery. 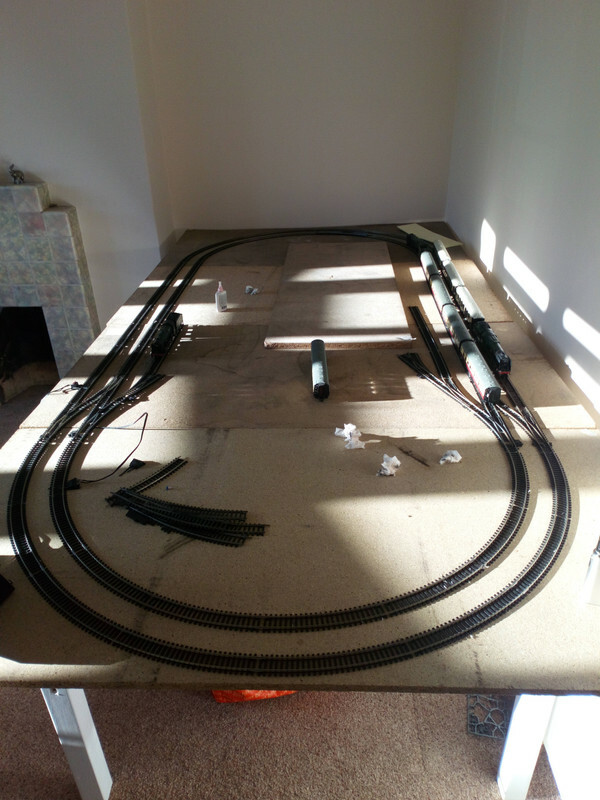 If the turntable is a must then the return loop can go, giving lots options for the green sidings. If the green half loop is shrunk back a couple of inches. (the whole point cluster slides, at the top) then there is room to add scenery in the form of a raised town-scape over the two outer lines, with a retaining wall between them and the inner loop. The inner loop can be broken up by having a ramped access road from the goods area to the raised level, which the inner loop will pierce, next to the retaining wall. What a brilliant plan. Almost makes me want to take mine down and copy yours! Only problem I have a Norman castle about where your fiddle yard is. That reverse loop is a fantastic touch, I've not seen one before worked into a 4x8. Good stuff! If space can be spared, you might want to move the table about two feet from the walls to allow easier access. It's certainly not a must atm, I think it's one of those childhood things you kinda want and then cry when you see how much a decent one is. That's certainly a great plan. Atm I'm still getting all the bits together. I'm going to put it on wheels to resolve that, I have to allow room for the door. Now gotta find someone to convert the split chassis bachman to dcc. I built one layout where the substructure was bedroom furniture on castors. Storage and appearance dealt with in one go. Where the layout would only need to move in one direction, to get behind it occasionally, washing machine rollers would seem like a good fix. Well hopefully I can get the wheels sorted out on my next day off (I've been doing a lot of overtime recently). My my rota Scott set, loads of extra track. Need to properly finish the board. I'm going to need a lot of points! I'm still trying to figure out if I change the track to finescale as electrofrogs would make the wiring a lot easier when I convert to dcc. Anyone know of a reasonable service for converting the split chassis bachman? Just got my royal scot and merchant navy back from the rail doc, repaired (and chip installed in the Royal scot. I'm not sure why I even bother with plans, it seems to evolving on its on lol. Had to get a new chip for my 9f, seems my select can't reasign its number. Station will be on the left, round the bottom right will be a turn table. Found myself some bargains on Hattons, they have non-isolating set track points for £6 by bachman. They've really improved the running of the layout. You might wish to consider a back drop on that leading edge to prevent trains from taking flight...to the floor. Has happened to me on occasion. As an intermediate measure I used cheap thumb tacks and left over foam road bed along the edge to prevent tragedy. One thing to remember regarding the reversing loop, if your going to run multiple units which are electrically coupled the loop will need to be at least as long as the unit between isolating gaps to switch (DC or DCC) I forgot this years ago when building my Japanese N Gauge layout and some of the longer Kato MUs were too long. Please let me know if anything in my post offends you......I may wish to offend again. Well I don't think he's taking anymore work until. December. Certainly did a good job on my merchant navy. That's a good idea, I'll certainly do that. I don't think I'll be doing a reverse loop, I think I'll be using a turntable. I was thinking of a raised end terminal, but I don't think it will work the way I wanted. Still I can run 4 engines at once on the main loop. There is a strong C.J. Freezer type flavour with this plan, it looks like one of the ones I used to pour over before I had the room to build anything, will watch this develop with interest, a good strong urban setting needed. Could I suggest an elevated road to weave its way from right to left, and split the layout in half scenically. Nice looking plan, I certainly like the idea of a raised bit of scenery, perhaps a small part of a town. Anyway, here's me having a little play yesterday. Itsonlyme wrote: Nice looking plan, I certainly like the idea of a raised bit of scenery, perhaps a small part of a town. Watching some trains go by is a fun start but the trick is to keep pushing on! Although I'm were you are still! Sadly my income is limiting my ability to progress as fast as I'd like. I've got most of the expensive bits I wanted now so I can Concentrate on getting all the track I need. I've also been looking at a station I like the look of. Also need to get my Hands on a turntable (which will probably be a peco one). Lots to do, just a case of when really.